1. Keenness and quickness in understanding and dealing with a situation, shrewdness; keenness of discrimination: Eve's business acumen was a critical factor in her choice as the CEO of the large corporation. 2. The ability to make quick, accurate, and intelligent judgments about people or situations; mental sharpness and intelligence: As a recent graduate in business administration, Trudy has considerable business and financial acumen. 3. Speed, accuracy, and keenness of judgment or insight: The student contestant had the acumen to figure out which version of the homograph to spell correctly even though the two words had the same exact pronunciation. 4. Etymology: from Latin acumen, "a point, a sting"; hence, "mental sharpness, shrewdness"; from acuere, "to sharpen". The pronunciation (uh KYOO muhn), with the stress on the second syllable, is an older, traditional pronunciation reflecting the word's Latin origin. In recent years it has been replaced as the most common pronunciation of the word by an Anglicized variant with stress on the first syllable, (AK yuh muhn). A keen mind may be compared to a sharp knife, which penetrates easily and quickly. For clean-cut action, both the knife and the mind must be "sharp". So it is natural that, when a word was needed to denote the faculty of keen, penetrating thought, the Latin word for "sharpness" should be borrowed. 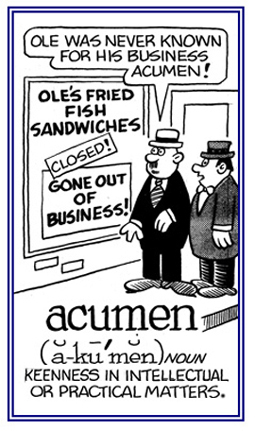 Acuere, in Latin, means "to sharpen", and acumen means "sharpness". English borrowed acumen and used it figuratively for sharpness of the mind. 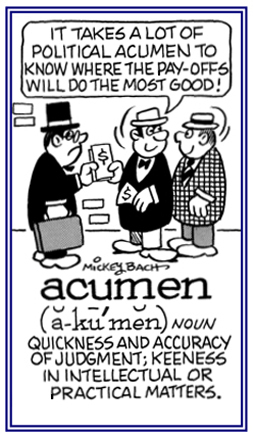 Acute, from the past participle of the same Latin verb acuere, means "sharpened, keen", and it is used broadly in a figurative sense.